LexiPhi was contracted by Dr Brooks to put together a website showcasing the work and life of the well-known Australian fantasy author Sara Douglass, who passed away in 2011. We wanted to make a site that honoured the creative estate and literary legacy of this wonderful author rather than simply resurrecting her old web site which had disappeared after her passing. The domain name was also inaccessible as the registrar had outdated contact details on their system and the support desk was spectacularly unhelpful. The original domain name was eventually retrieved after persistently hounding the registrar via various avenues for months, the domain name is now forwarded to Sara Douglass Worlds. The website Sara Douglass Worlds was developed using content accessed from numerous archives of the various websites and iterations Sara Douglass had created over the years of her working life. This huge amount of information was separated into posts, edited then grouped to make navigation to make the content easily accessible. The front page was set up to feature latest news and items of interest, which is changed and updated as required. The authors of articles/interviews etc were all contacted and asked for permission to reproduce, or if they were unable to be found, their work was reproduced in line with current copyright law. The website continues to showcase Sara Douglass and give her friends and fans, both new and old, an intimate insight into her work and life. Nonsuch Kitchen Gardens was the personal website and blog of author Sara Douglass and LexiPhi was contracted to restore it in full as a memorial. The old website was html with a wordpress blog attached, the current one is a full wordpress site. All the content was accessed via online archives, the original pages were restored after being grouped into sections including her photographic galleries. The two blogs complete with extensive comments were also restored, after being grouped in sections. The home page banner was made using images taken from the old website. LexiPhi does ongoing maintenance and support for both websites. The Worlds of Sara Douglass website uses a customised wordpress theme, and developed using original copy and images accessed from numerous archives of SaraDouglass’ many websites over the years. The content was grouped together under headings, with links to other relevant sections. The front page is set up to present new articles or promotions as they happen. 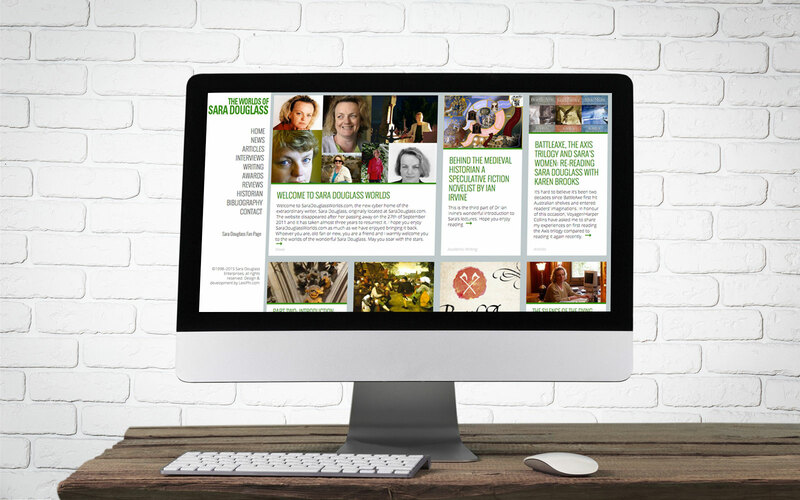 The Nonsuch Kitchen Gardens website was a full restoration of Sara Douglass’ personal website within a new framework. The website was built using a wordpress theme with all the pages, blog posts, comments and images retrieved and restored from online archives.